Peeled potatoes will quickly turn brown if not cooked immediately or stored properly for future use. 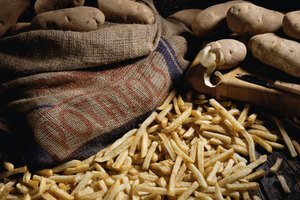 But, sometimes it's necessary to peel potatoes a day or two ahead of when they are needed, especially if planning a large meal. 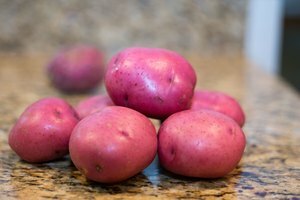 You can store peeled potatoes for several days or up to a few months with the right preparation. Peel and prepare the potatoes as if you are going to cook them the same day. Place the potatoes into a large bowl. Cover with ice. Fill the bowl with water. Put the lid on the bowl (or cover with plastic wrap) and refrigerate up to three days. The ice helps to keep the potatoes crisp. Preheat the oven to 350 degrees. Cut the potatoes into slices, cubes or fries. Place the prepared potatoes in a single layer on a cookie sheet. 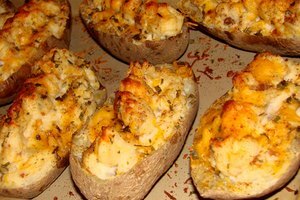 Bake the potatoes for 10 minutes. Remove the potatoes from the oven and let them cool. Fill plastic freezer bags with the half-cooked potatoes and freeze them. Remove them from the freezer as needed and finish cooking by boiling or baking. Frozen half-cooked potatoes will keep for three to four months in the freezer. 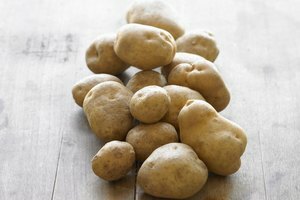 Save the potato water from refrigerator-stored potatoes for use in homemade bread and noodles. 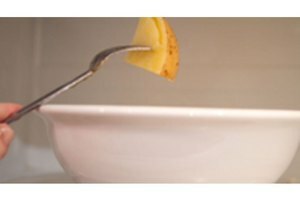 Substitute equal amounts of potato water for the liquid called for in the recipe. The water can be kept in the refrigerator for up to 14 days. Scalloped, au gratin or skillet fries are great recipes for half-baked, frozen potatoes. They can be kept on hand for a quick and easy side dish.